What Day Of The Week Is November 3? 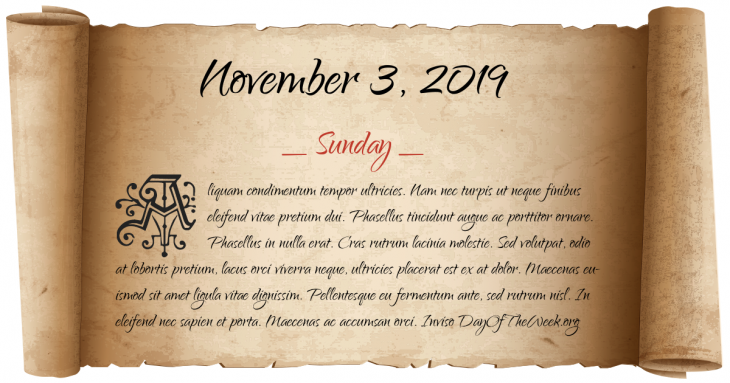 November 3, 2019 is the 307th day of the year 2019 in the Gregorian calendar. There are 58 days remaining until the end of the year. The day of the week is Sunday. Umar ibn al-Khattab, the second Muslim caliph, is assassinated by a Persian slave in Medina. The River Arno flooding causing massive damage in Florence as recorded by the Florentine chronicler Giovanni Villani. The Times of India, the world’s largest circulated English language daily broadsheet newspaper is founded as The Bombay Times and Journal of Commerce. The United States introduces an income tax. Mariner program: NASA launches the Mariner 10 toward Mercury. On March 29, 1974, it becomes the first space probe to reach that planet. Iran-Contra Affair: The Lebanese magazine Ash-Shiraa reports that the United States has been secretly selling weapons to Iran in order to secure the release of seven American hostages held by pro-Iranian groups in Lebanon. The Federated States of Micronesia gain independence from the United States of America. Who were born on November 3?